Welcome to Toronto… | Mmm, Tasty! It’s been a crazy last two weeks. On January 28th, our apartment in Ottawa was loaded into a truck, and on January 30th, it was unloaded here in Toronto. Ever since, we’ve been trying to organize our belongings and generally figure out what to do with all our stuff. This, of course, has meant we haven’t had a lot of time to enjoy Toronto or cook things in our new (to us) kitchen! 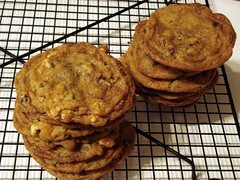 Last night we decided to make chocolate chip cookies as our inaugural baked treat. Instead of going to one of our standby recipes, we decided to try a different one, courtesy of David Lebovitz. His version packs a whole lot of chocolate chips into a single cookie, which is exactly what we wanted. We did half with just chips, and half with walnuts. Yum. This also marks the very first post on Mmm, Tasty! instead of Epicurean Ottawa. Welcome to our new blog! We’re still working on the overall design, but it’s functional, at least. More Toronto posts coming soon.